Norwegian Breakaway on her sea trials earlier this year. Photo courtesy of Meyer-Werft. Merely getting ready to write about Norwegian Cruise Line’s new Norwegian Breakaway is a task in itself. 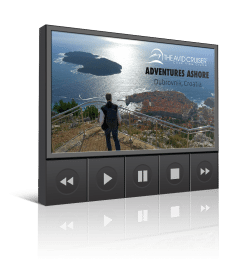 Capable of carrying 4,028 guests, the new ship is so loaded with interesting and innovative features that describing them all would take more space than we have available here. It’s also arguably poised to be the most successful, popular ship Norwegian Cruise Line has built in its long history. Like Norwegian Epic, Norwegian Breakaway breaks the mold when it comes to entertainment options aboard cruise ships. Gone are those “Tribute to Abba!” variety acts that you can see on any line, any time, replaced instead aboard Norwegian Breakaway with premium acts like The Rockettes and Rock of Ages. 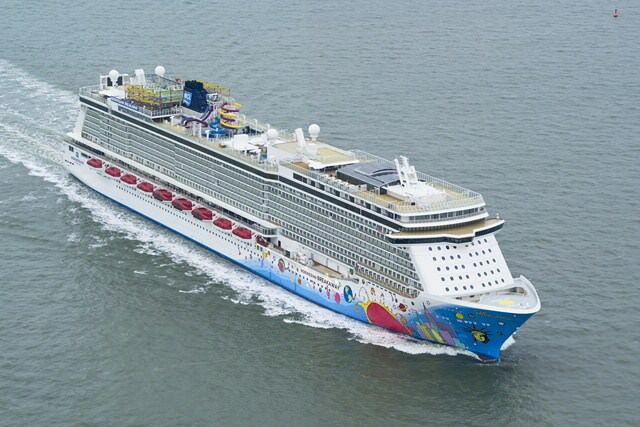 Norwegian Breakaway improves on Norwegian Epic — by strides. 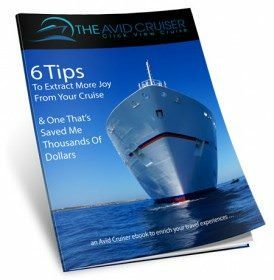 The result is a ship that is surprisingly well constructed, and one that is poised to take Norwegian Cruise Line in an entirely new direction. 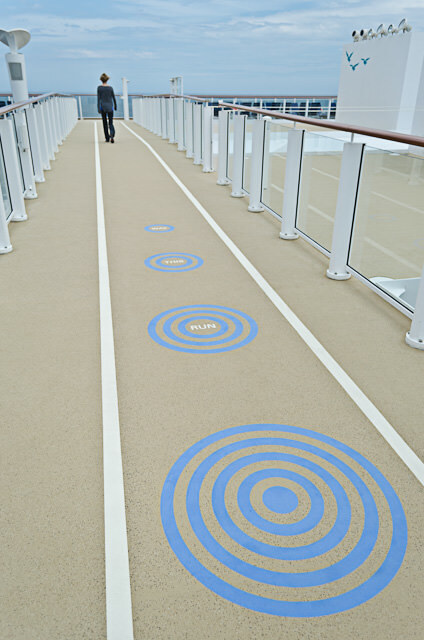 Following the launch of Norwegian Epic in 2010, the line’s newbuild team noticed that several areas of the ship — like the Bliss Ultra Lounge — cleared out following scheduled activities. From a revenue standpoint, that didn’t make a lot of sense. From a guest standpoint, it increased the amount of distance passengers would have to walk to dinner or to their next entertainment venues. Because of that, the company made the decision to centralize most of the ship’s entertainment venues, restaurants and lounges on Decks 6, 7, and 8 — hence the name 678 Ocean Place. This decision also meant that some of the bottlenecks that could occur aboard the Norwegian Epic are almost non-existent here. The ship’s design is more intuitive than on Norwegian Epic, with public rooms that complement each other and are noteworthy for their unusual levels of intimacy for such a large ship. 678 Ocean Place includes long-standing Norwegian Cruise Line favorites like Le Bistro, La Cucina and the always-hopping Wasabi. For Breakaway, Norwegian Cruise Line also partnered with noted Chef Geoffrey Zakarian to offer Ocean Blue by Geoffrey Zakarian. Open for take-away lunch or sit-down dinner, Ocean Blue was the talk of our short preview cruise, and for good reason: The food is phenomenal. Norwegian seems to have struck gold with The Waterfront, creating one of the most pleasing new features we’ve seen aboard a ship in a long time. In fact, the entire concept is so zen that we’re surprised no one has done this before. Running three quarters of the length of the ship on both port and starboard sides and wrapping attractively around the stern, The Waterfront has everything that traditionalists love about the space. 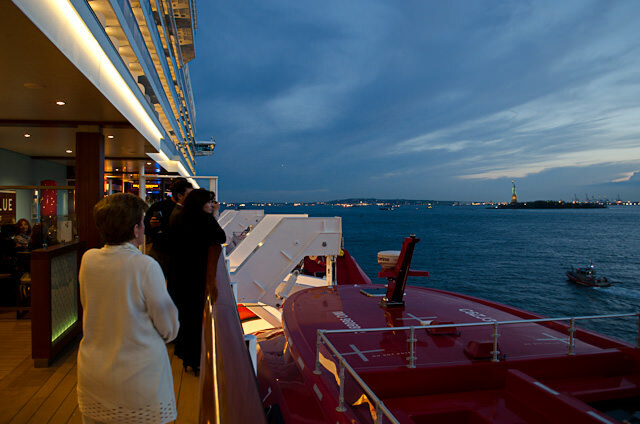 In an age where many mainstream cruise lines are looking to do away with the traditional Promenade Deck completely, The Waterfront is the feature that caused the most buzz aboard our two-night inaugural sailing from New York. Tucked away in an unassuming corner on the starboard side of Deck 8 is one of the smallest venues onboard. It’s also the one that had queues consistently stretching back into the aft stair tower. What was all the fuss about? An extension of Carlo’s Bakery, the popular family business of Hoboken-based “Cake Boss” Buddy Valastro. You may have seen Buddy’s work before in the television series, Cake Boss. Featuring all of the delicious treats and confections that the original bakery is known for, Carlo’s Bake Shop on Norwegian Breakaway will also let guests pre-order custom specialty cakes for celebrations, and even offers special cake decorating classes. Dolce Gelato also uses the same space just outside on The Waterfront, meaning this small space almost continually draws a crowd. Norwegian went all-out in designing the AquaPark and Sports Complex aboard Norwegian Breakaway. Spanning decks 15, 16, 17, and 18, this stunning area includes five multi-story waterslides, one of which is the fastest drop slide at sea — and one of the area’s hottest attractions. For those who like their water activities on the milder side, there are two traditional swimming pools, along with a special Spongebob Squarepants-themed pool area for the kids. The Sports Complex is home to a rock-climbing wall, bungee trampoline, Spider Web climbing cage, and one of the more attractive mini-golf courses we’ve seen aboard a ship. There’s also a gigantic ropes course and a zip track that includes a defining element known as The Plank, an 8-foot-long (2.5-meters) bar that extends beyond the side of the ship and high above the sea. Guests can walk The Plank, with harnesses for safety. The big news on the stateroom front aboard Norwegian Breakaway is just how well-designed they are. Gone are the wavy walls that characterized Norwegian Epic, along with the latter’s sometimes-controversial bathroom. In its place, the company has crafted staterooms that are surprisingly spacious and well thought-out. Even before hitting the top-of-the-line categories in The Haven, Norwegian’s exclusive ship-within-a-ship concept, designers added little niceties to each category like rainforest showers with six positional jets in Mini-Suite Balcony staterooms. 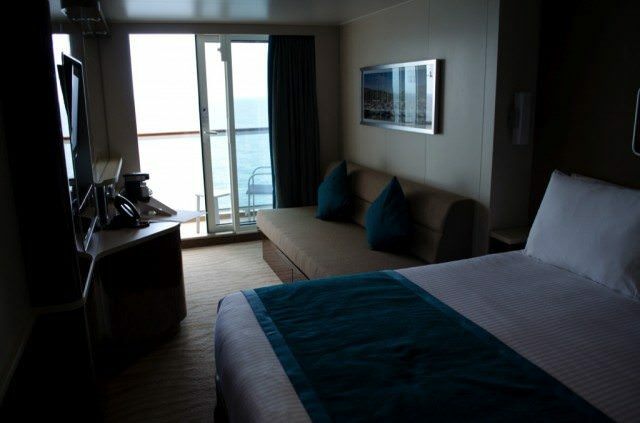 Oceanview staterooms are back aboard Norwegian Breakaway after being excised aboard Epic. Here, they boast the same sleek styling as the rest of the staterooms onboard, and are larger than average, with bathrooms that use the same kind of swing-door shower concept that ultra-luxury line Silversea uses for their Veranda Suite bathrooms. Also back are the hottest accommodations around: Norwegian’s futuristic and funky Studios. Designed for the solo cruiser, these rooms feature their own keycard-access hallways and even a private lounge where Studio guests can socialize. Looking for someone to walk the plank with? You can sign up for that on a “get-together” whiteboard that invites other guests to join in the fun. The ultra-luxe enclave known as The Haven also returns, with suites too numerous to list here, except to say that there’s not a bad one in the bunch. Norwegian has also expanded The Haven aboard Norwegian Breakaway to feature both forward and aft-facing suites on a number of decks. With Norwegian Breakaway, Norwegian Cruise Line seems to have finally hit upon the magic formula that the company has tried for so long to achieve. As Norwegian Cruise Line President & CEO Kevin Sheehan himself noted, the line has always had brilliant ideas; they’ve just been mired with poor execution. Much of what you see aboard Breakaway is an extension of Sheehan and his team, who have worked hard to give Norwegian a distinct voice in the industry. 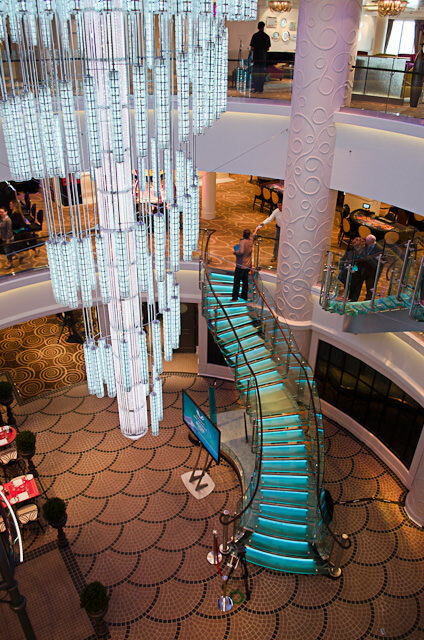 With her elegant, almost Oceania-esque interior styling and her plethora of wholly unique dining and entertainment options, Norwegian Breakaway isn’t just a complete departure from anything Norwegian Cruise Line has done before; it’s a complete departure from how the industry views cruising — a true breakaway indeed. Please share your impressions here when you return. We welcome your comments. I hope it all works out favorably for you. Here is what I found to be terribly unhealthy, the glassware in my room was not cleaned and was just put back in place with white paper caps on them as if they were clean. I know this because when I started my cruise I poured some water and saw there was lipstick on the glass and then AFTER THE ROOM WAS MADE UP BY THE ROOM STEWARD, THE SAME, USED, LIPSTICKED GLASS, WAS PLACED BACK IN THE COUNTER WITH ONE OF THOSE PAPER CAPS ON IT, indicating it was a clean glass when it was just, I guess wiped off(how clean could the rag be). How long it was and how many people drank water out of that glass next to the ice bucket I do not know, what I know for a fact is that a dirty glass was placed back as clean. Also there were other dirty things about my room but nothing as disgusting as used drinking glasses! !